Summary: Fenestrations of the cerebral arteries are uncommon, and aneurysms in association with fenestrations are even more uncommon. We report the case of a saccular aneurysm associated with a posterior cerebral artery fenestration in a child with subarachnoid hemorrhage. The patient was successfully treated with Guglielmi detachable coils. This case is unusual because of the patient’s age and the location of the fenestration. Fenestrations of the cerebral arteries are uncommon, with a reported angiographic incidence of 0.03–1% (1–3) and a reported postmortem incidence ranging between 1.3%(4) and 5.3%(5). Typical locations for cerebral arterial fenestrations include the anterior communicating artery (6), the vertebrobasilar system, and the anterior cerebral artery (7). Aneurysms in association with fenestrations are even rarer, although those fenestrations are widely believed to predispose patients to aneurysm formation (2, 8). We report a saccular aneurysm associated with a posterior cerebral artery fenestration in a child with subarachnoid hemorrhage. The patient was successfully treated with endovascular treatment. This 11-year-old boy was in good health until he was found unresponsive in his bed at night. He was taken to a local hospital and gradually became responsive with complaints of headache, severe photophobia, and a stiff neck. Findings from the initial neurologic examination were reportedly normal. Initial laboratory results were normal. A CT scan of the head showed subarachnoid hemorrhage in the posterior fossa. Isotonic fluids were administered, and the patient was transferred to our institution. Upon admission, the child complained of occipital and bifrontal headaches and nausea. Mild meningismus was noted. His neurologic examination findings were nonfocal. An MR image obtained the following day showed a round flow void and two tubular structures anterior to the right side of the pons. 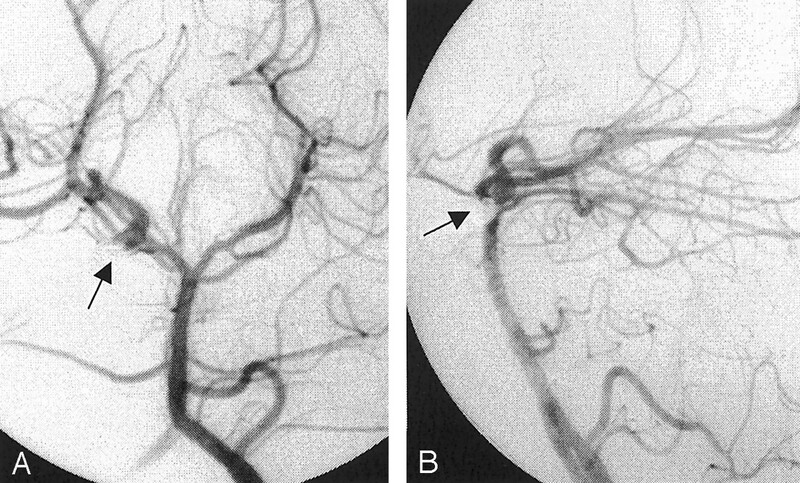 A cerebral angiogram was obtained (Fig 1); this showed aneurysmal dilatation at the proximal end of a tubular structure overlying the right posterior cerebral artery. After a multidisciplinary evaluation involving neurosurgical, neurointerventional, and neurologic inputs, the child and his family were offered endovascular therapy for this aneurysm. Under general anesthesia, the child underwent transarterial aneurysm obliteration with Guglielmi detachable coils (GDCs). 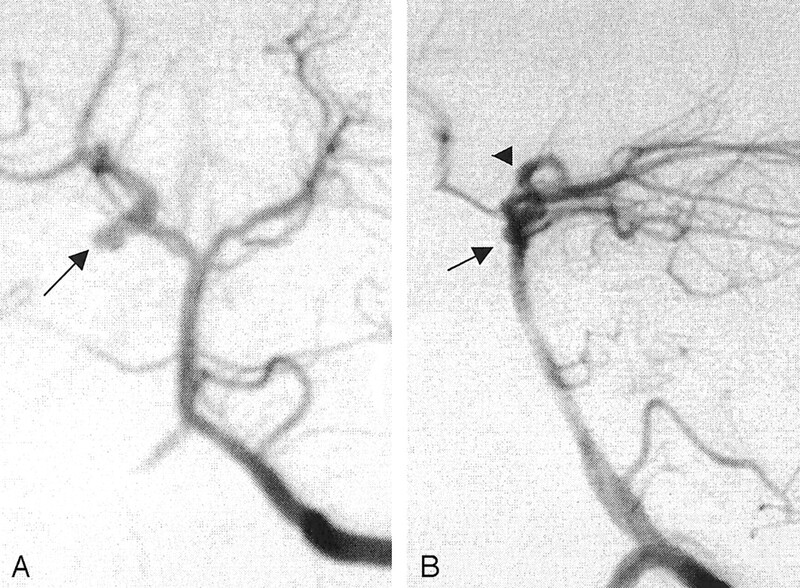 Superselective angiography (Fig 2) confirmed the saccular nature of a broad-based proximal aneurysm in a duplicated segment of the right posterior cerebral artery. Postoperatively, the patient remained in the neurologic intensive care unit for 24 hours and recovered well. He was discharged from the hospital 3 days later after a short course of intravenous heparin (Abbott Laboratories, Abbott Park, IL). The patient’s headache resolved completely within a week of discharge. As of this writing, he has remained neurologically intact and has resumed all previous activities, including playing soccer without problems. 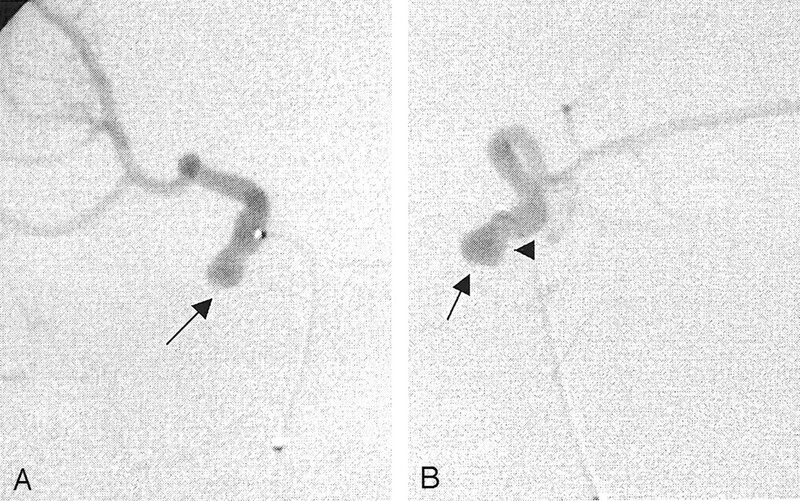 Follow-up angiography performed at 6 months showed persistent aneurysmal obliteration (Fig 3). We failed to find in the literature any report of fenestration-associated aneurysm in a child. In one series of 37 patients (3), which was mostly concerned with fenestrations and their possible association with aneurysms, the youngest patient was 18 years old. To our knowledge, this not only is the first report of a ruptured saccular aneurysm associated with a fenestrated posterior cerebral artery but also the first report of such an aneurysm in the pediatric population. Fenestrations of the cerebral arteries are rare, and a significant discrepancy exists between their reported angiographic incidence of 0.03–1%) (1–3) and their postmortem incidence of 1.3–5.3%(4, 5). This discrepancy has been attributed to both the higher sensitivity of the postmortem examination and the likely under-reporting of fenestrations on angiographic reports due to their uncommon nature (3). A fenestration is a division of the arterial lumen, with resulting separate channels, each with its own endothelial layer and muscularis tunica; the adventitial layer may or may not be shared between channels. At the most, a fenestration results in multiplication, usually duplication, of the vessel. Duplications commonly involve the anterior communicating artery (6–9), where spiderlike connections have been demonstrated in as many as 19% of autopsy specimens (5). Although uncommon, fenestrations of the vertebrobasilar system with or without associated aneurysms have often been reported (7, 10–14), principally in the Japanese literature. Much less common are aneurysms arising from fenestrations that involve the anterior cerebral artery, (15, 16) the middle cerebral artery, (17–19), or even the posterior inferior cerebellar artery (20). In a study of anatomic dissections of 100 human brains (21), anomalies of the posterior cerebral artery were noted in 3%of the specimens. These dissections were found to exclusively involve the precommunicating or P1 segment, including one fenestration in this segment. Another postmortem anatomic study of the posterior cerebral artery segment distal to the posterior communicating artery revealed three possible courses of the distal vessel and revealed a 1.4%incidence of fenestration (22). The embryologic basis for segmental duplications of cerebral arteries is consistent with an incomplete or absent fusion between primitive neural arteries (23). Defects in the medial layer with a decrease in the smooth muscle and collagen content can be microscopically identified at the proximal and distal edges of the duplicated segment. Defects are more severe at the medial and ventral walls of the proximal juncture and result in saccular aneurysm formation (24–25). In addition to medial defects, flow phenomena at the proximal end of fenestrations, where hemodynamic stress and increased turbulence are present, may contribute to aneurysm formation (10), although aneurysms have also been reported at the distal end of fenestrations (13). However, some have also suggested that the incidence of fenestration-related aneurysms is the same as that of berry aneurysms in the general population (3). Our patient’s aneurysm was saccular; it arose from the proximal edge of a fenestration and projected ventrally. 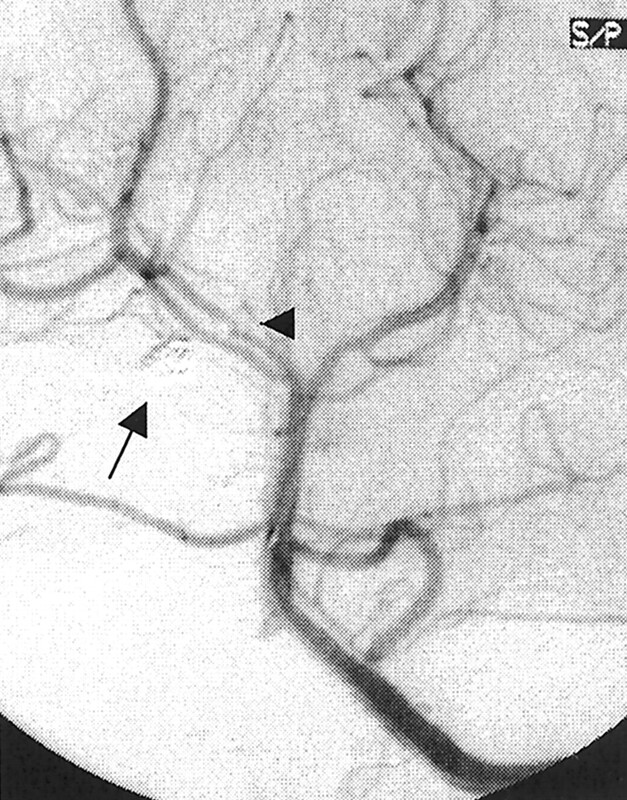 All of these features are reportedly common for such aneurysms (2–4, 7, 9–10). The patient’s age and the location of the fenestration both contribute to making this case extremely unusual. Most fenestration-related aneurysms reported thus far have been treated surgically, although successful transvascular therapy with either detachable balloons (14) or, more recently, GDCs (26–27) is reported. The anatomic location of this aneurysm was thought to be associated with a relatively high surgical risk. Therefore, our patient was treated with GDCs, which permitted total obliteration of his saccular aneurysm (Fig 3). Interestingly, the placement of a microcatheter across the fenestration resulted in the temporary occlusion of the proximal edge of the fenestration (Fig 4). We elected not to obliterate the dysplastic-appearing duplicated segment because of the possibility of a stroke from occlusion of the perforating arteries, which can arise from either limb of a fenestration. Because medial defects can involve either edge of a fenestration, this young patient will have to be followed up at regular intervals. Soon, such follow-up might be performed in a noninvasive way, at least intermittently, as the accuracy of newer MR imaging techniques (28) approaches that of angiography in routine follow-up. To our knowledge, this is the first report of a saccular aneurysm associated with a posterior cerebral artery fenestration in a child. In addition, the aneurysm had ruptured, causing subarachnoid hemorrhage. The patient had an excellent outcome after he was treated with GDCs.